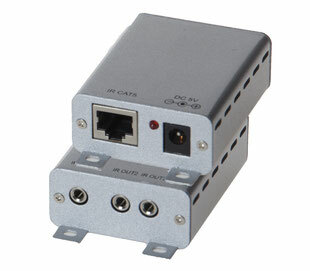 The IR Extender and the IR Repeater Box are perfect for controlling source devices over long distances using CAT5 Cable. By using the built-in IR Receiver of the IR Repeater, users are able to control up to five sources (with the original remote controls) at the same time at a distance of up to 250m. There are no space limitations with these devices, which means even if the sources are in a different room or even another floor than the display, the performance stays the same. The IR Extender and the IR Repeater Box give users an easy and convenient way to control their desired source. If however, users only wish to control sources in the same room then the IR Repeater Box will be enough to control up to 2 sources. The IR Extender Box is designed for longer distances and extra source device control than the IR Repeater Box. The 4 by 4 Infrared Matrix is designed to control up to four sources from four display locations, using the original source remote or universal remote controls. You can control DVD/Blu-ray players, satellite and set-top boxes. A true matrix design allows any of the four inputs to be routed to any (or all) of the IR outputs giving full independent source to screen control. With the added benefit of an IR master input and output, which can be used to control an HDMI™ matrix, this product will allow you to fully control your sources and displays. Simply place the IR extender near the display and put the IR blaster in a position so that all devices will receive the IR signal. So, if you are looking for a way to extend the control of IR, The 4 by 4 Infrared Matrix is a great choice. 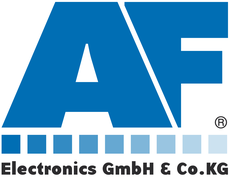 With USB being the standard connection for consumer electronic products, there has long been a need for something to let us operate our many devices over long distances. The USB over CAT5e/6 transmitter and receiver boxes developed for this purpose as they can operate in both the home and commercial markets. These devices allow most of the USB host to send data bidirectional within a 100-meter distance while offering up to 4 USB outputs, giving this product the ability to act like a USB hub. In addition, this product can also access data from the output port devices even when there’s 100 meters separating the devices or using Ethernet hub in between to extend the distance double up to 200 meters. 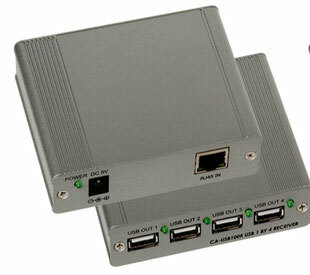 The USB over CAT5e/6 transmitter and receiver boxes are the ideal choice for your USB extension needs.